With the use of telescopic poles, any of our banners can be made much taller if required. The graphic doesn’t necessarily also have to be made taller, you can just hoist a shorter banner up high if you like. This is particularly useful when you have applications where the additional height would be an advantage but you also have times where height is restricted. For example, use a 2m tall graphic but increase the height of the display to 2.5m where you can and use it at 2m where height is restricted. The telescopic poles are beautifully designed and engineered and feature a simple twist lock mechanism. Just position them anywhere between their min and max height. The poles are made from aluminium tubes of various diameters. 19mm & 16mm for the V-250 and 19mm, 16mm & 13mm for the V-374. These displays are very lightweight. Using a telescopic pole adds very little weight to a system versus using a standard fixed height pole. The only effect on portability is that a longer carry case is required with Crossbase systems only – to accommodate the 135cm pole. For all twinbase and wide banner stands, the carry case size is unaffected. As mentioned, the telescopic poles allow much greater height flexibility than standard fixed height poles. They are also interchangeable with standard poles and use the same clip sets as all components have been designed to work together. This means that you could of course upgrade an existing Crossbase banner system for example just by adding a telescopic pole. 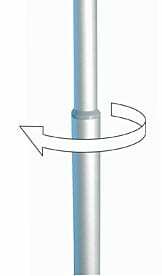 The telescopic poles just require a simple twist to unlock, then extend to required height, then twist back to re-lock into position.